The Talon research and development team is proud to introduce Gridview – a technology that will enhance the way power lines are inspected. Using a custom drone, Talon mounts an x-ray imaging machine to safely inspect conductor sleeves on power lines. 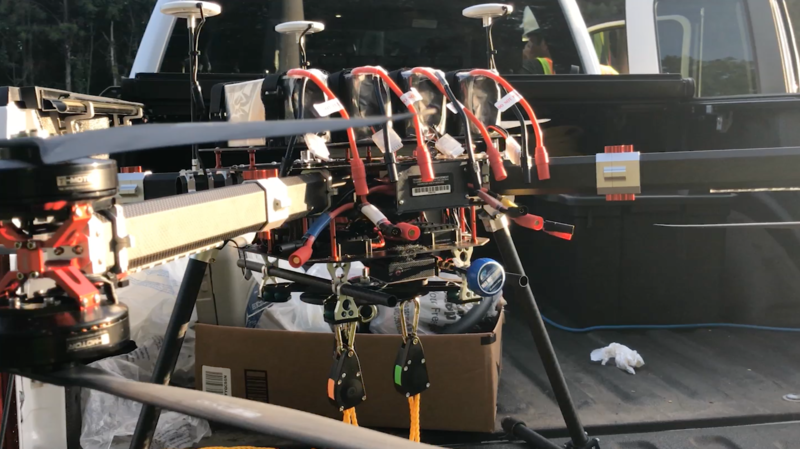 Talon tested various drones and X-ray processes that led to successful operations conducted on de-energized power lines in the field earlier this month. Inspecting power lines is currently a process that involves the use of helicopters, bucket trucks, and multiple personnel staged along the lines – this process proves to be both time consuming and costly. Talon flight teams fly a drone, with our custom x-ray harness attached, and applies the technology to the conductor sleeves. Using remote digital x-ray technology, we instantly generate the image for review on the ground. The imagery can also be delivered anywhere in the world through our cloud-based data portal. All this work is performed without grounding lines or disrupting power service to customers. Inspecting critical infrastructure for potential issues saves power companies time and money. Gridview enhances the process by finding defects faster, more accurately, and safer. Gridview is faster, as it can inspect about one conductor sleeves every two minutes. Gridview captures multiple images rapidly to provide several references to improve data accuracy. By conducting all data collection operations from the ground, the Gridview data capture process is much safer. Eric Hare, COO of Talon, introduced Gridview at the EPRI conference this week and our technology instantly proved effective, actionable, and relevant to powerline inspections. To learn more about Gridview and other Talon services please, contact Eric Hare or visit us at Talon.io.